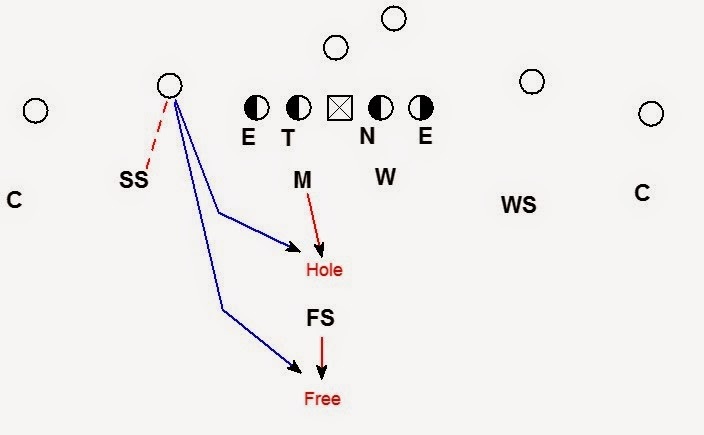 This is the second post is a series about Cover 1 (Man Free) from a 4-2-5 defensive personnel. 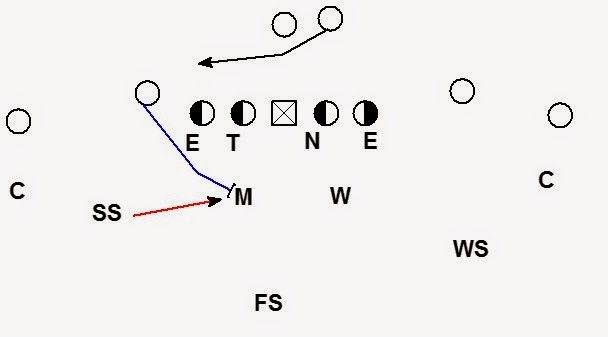 The focus of this post is the man technique of the safeties covering an inside (#2 or #3) receiver. Some terms in this post reference the techniques described in the first post. 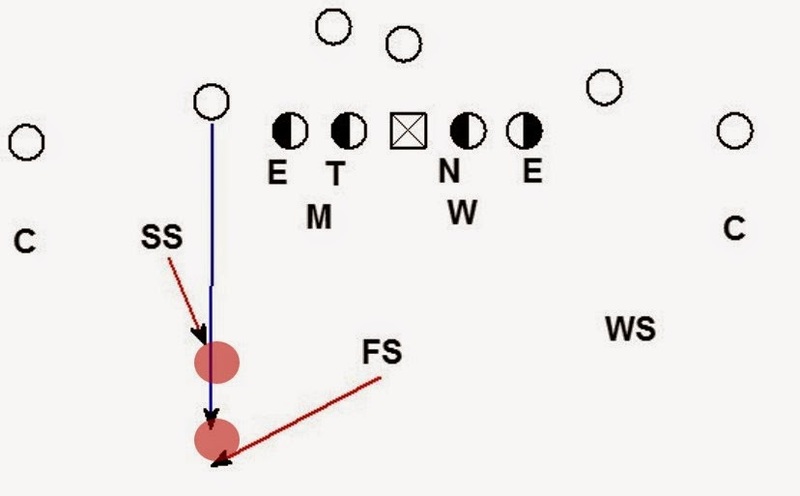 You may also notice, many of these techniques are similar to the fire zone coverage concepts covered on Blitzology in the past. Against a normal split receiver, the safety will take an outside leverage alignment. He can expect inside help on short inside routes from the Hole player and deep inside help from the Free player. A wide split takes the DB further from his inside help. In that case the DB will adjust to inside leverage to deny the easiest throws. The DB’s eyes are on the WR’s hip. Where the hip goes tells the DB how to react. When the receiver’s hip is outside the DB should be in good position to get in phase and cover the flat route. While getting in phase, he must be able to access the difference between a flat route and a wheel route. Many times the WR takes a more vertical path to the flat when running a wheel. DB’s must also look for the differences between flat vs. wheel routes in film study. When the receiver’s hip is vertical, the DB should get hands on the WR from the outside in and get in phase. We want the DB to see through WR to the QB. Throughout the route, he must maintain body position for outside breaking routes. The most challenging outside breaking route is the corner. For the safety to be successful he must make an efficient man turn into the route. 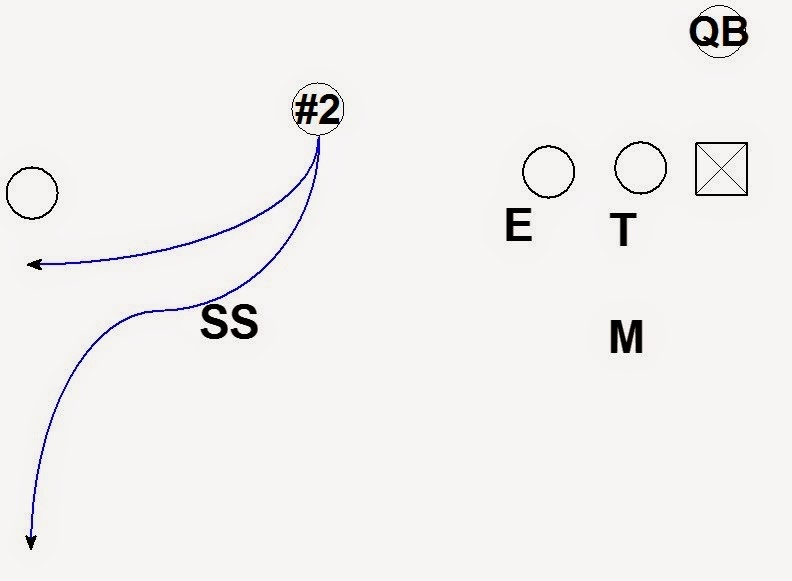 Once in phase, the goal for the DB is to lean on the WR forcing the route as vertical as possible. This action plays out like a corner leaning on a fade route. Instead of leaning the route into the sideline, the safety leans the route to the free player. If the WR runs a vertical or go route, the DB must defend any throws on a line (including back shoulder throws). By playing the vertical aggressively with the man coverage, the QB should be forced to put air on the vertical throw. Throws over the top of the man coverage should be handled by the free player. When the receiver’s hip is inside, the DB will use a Cut, Squeeze, or Pin technique depending on the depth of the break. When the hip of the receiver breaks inside immediately the DB should make a “Cut” call to the Hole player. After making the cut call the DB will replace the Hole player. 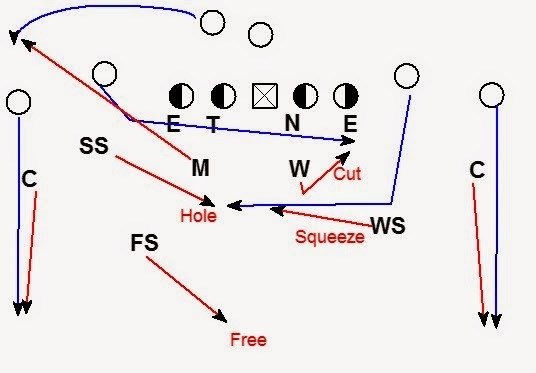 A cut call tells the Hole player to cut off the crossing route in man coverage. Against the whip route (in & back out) the DB must be patient in order to correctly identify what route the WR is running. On many shallow concepts the WR is running his route at the heels of the DL. 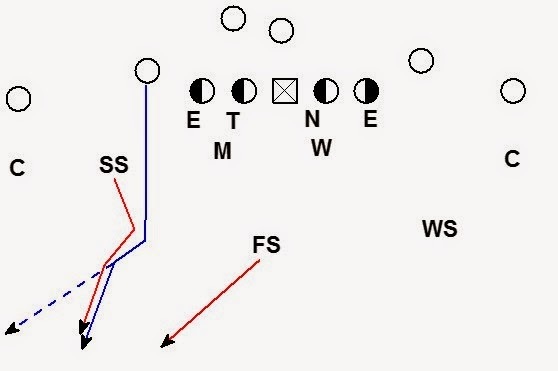 Most teams do not run a whip route from an initial release at that depth. Typically the route is deeper when the WR is going to run a whip. The DB must recheck a cut WR, looking for a whip route. He should be able to react from going to the hole and recollect the WR to the flat. Film study is crucial in helping the DB identify the difference between a crossing route and a whip route. When thinking about cover 1 the question naturally arises: Why not just play true man to man coverage and keep it simple? The cut technique is nuanced and requires practice to perfect. The reason for cut technique is for run support. In a true man coverage, if the receiver blocks inside the DB is going to go cover him. The receiver can occupy his man defender and the player he his blocking creating a 2 on 1 advantage for the offense. 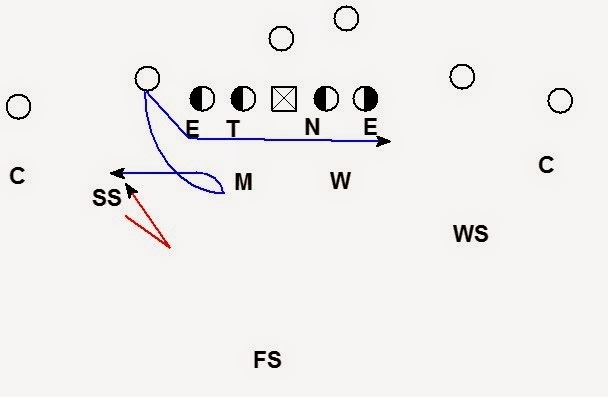 Allowing the DB to make a cut call lets the DB be aggressive attacking the run. When the hip of the receiver breaks inside at an intermediate depth the DB will use a squeeze technique. 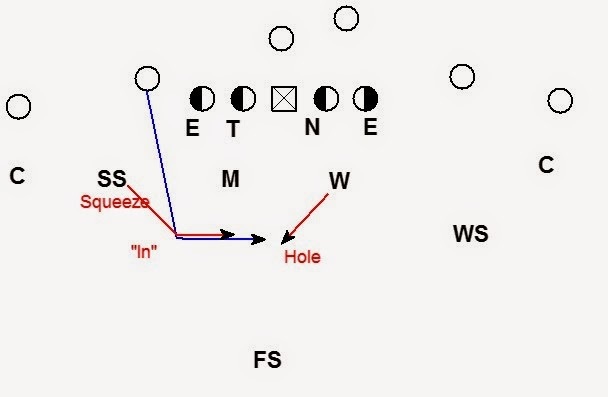 The DB should make an “In” call to alert the Hole player there is a route coming. 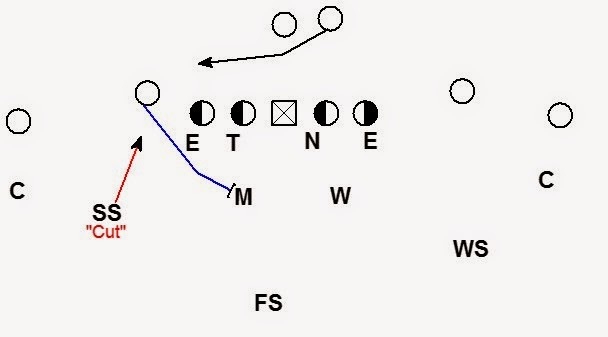 A DB squeezing will trail and strip the receiver. 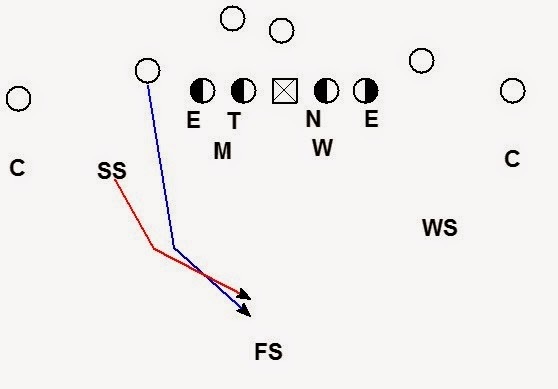 If the WR attempts to settle his route the DB should make the play. Otherwise the DB should squeeze the route to the Hole player. Throws out in front of the WR will be defended by the Hole player. Any other throw should be punched out by the trail and strip DB. When the WR sticks his foot in the ground and breaks to the post, the DB will use a pin technique. We want the DB to push the post vertical, pinning the post to the safety. 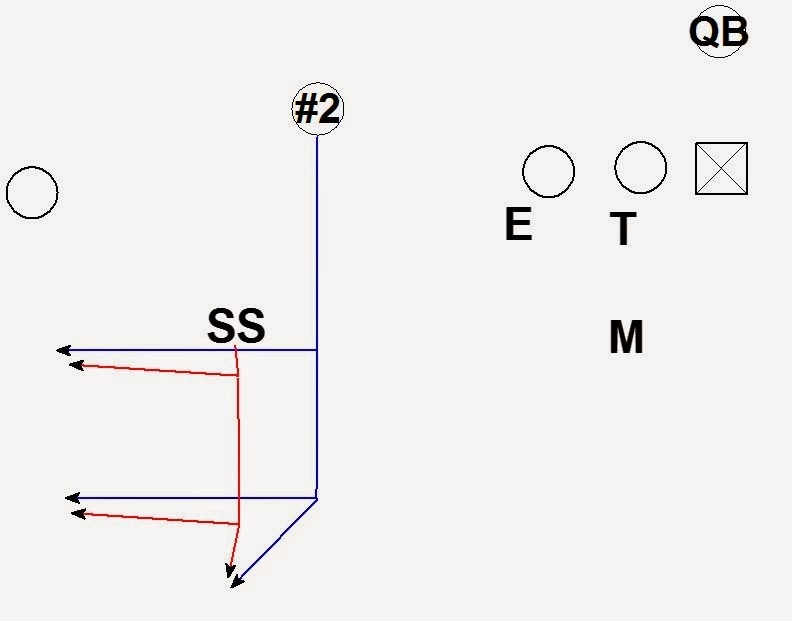 By playing outside leverage the DB is naturally going to be in a trial position on the inside post break. The DB will take a low hip position trailing the post. Any throws on a line will be handled by the man coverage. Any throws over the top are the responsibility of the free player. Mike & Will are in a fiddle (2 on 1) technique against the back. When the back releases to the Mike’s side the Mike takes him in man coverage. The Will become the Hole player. 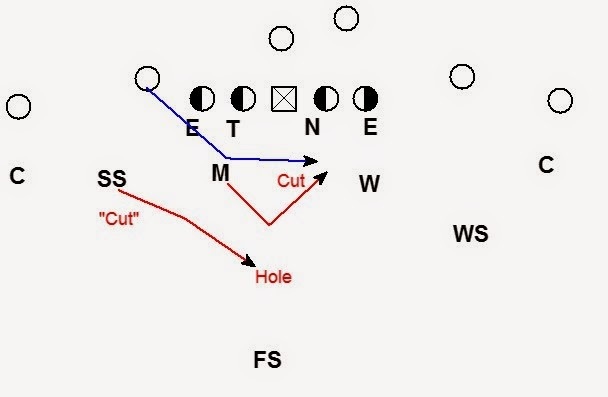 However, when #2 releases immediately inside the SS makes a “Cut” call and goes to the Hole. The Will cuts the crosser. The WS makes an “In” call and squeezes the in route to the SS in the hole. If there are route combinations you would like to see diagramed leave a comment or send an e-mail to blitzologyblog@gmail.com . great stuff, I really like the cut call, sound against all that shallow and mesh stuff you see so often. Great post! There is a ton of useful info. I love the vocabulary: cut, squeeze and pin. That makes teaching the technique so much easier. Nice work! I would be curious to see how the SS and WS react when both #2's release immediately inside and the back still releases. Do the SS and WS work to the hole? Do they just look for any crosser? Also, how do you defend #2 releases inside immediately, #2 runs a dig, and the RB releases to the dig side? Is it possible for a LB to cut a #2 that is on the same side as him? Thanks for reading the blog. Answers to your questions are up in a new post.